This screenshot was taken after all our regular tests had been run, hence there are already some writes to the drive, although nothing substantial. What surprised me was that the MWI was already at 92, even though I had only written 1.2TB to the NAND. Remember that the MWI begins at 100 and then decreases down to 1 as the drive uses up its program/erase cycles. Even after it has hit 1, it's likely the drive can still withstand additional write/erase cycles thanks to MLC NAND typically behaving better than the worst-case estimates. We've never received an Intel SSD sample that started with such a low MWI, indicating either a firmware bug or extensive in-house testing before the drive was sent to us. In a few days, I managed to write a total of 37.8TB to the NAND and during that time, the MWI had dropped from 92 to 79. In other words, I used up 13% of the drive's available P/E cycles. This is far from being good news. Based on the data I gathered, the MWI would hit 0 after around 250TB of NAND writes, which translates to less than 1,000 P/E cycles. I showed Intel my findings and they were as shocked as I was. The drive had undergone their validation before shipping and nothing out of the ordinary was found. 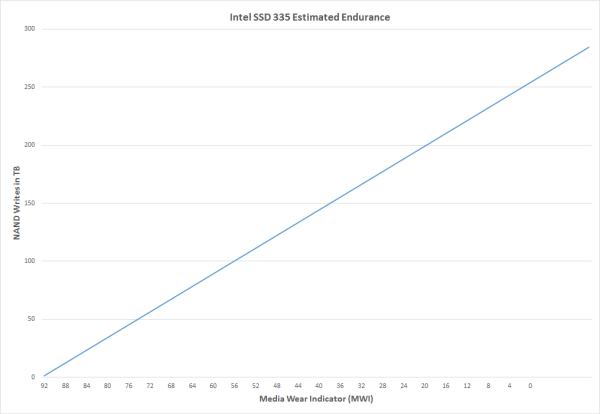 Intel confirmed that the NAND in SSD 335 should indeed be 3,000 P/E cycles, so my findings contradicted with that data by a fairly significant margin. Intel hadn't seen anything like this and asked me to send the drive back for additional testing. We'll be getting a new SSD 335 sample to see if we can replicate the issue. It's understandable that the endurance of 20nm NAND may be slightly lower compared to 25nm even though they are both rated at 3,000 P/E cycles (Intel does have 25nm with 5,000 cycles as well) because 25nm is now a mature process whereas 20nm is very new. Remember that the P/E cycle rating is the minimum the NAND must withstand; in reality it can be much more durable as we saw with the SSD 330 (based on our tests its NAND was good for at least 6,000 P/E cycles). Hence both 20nm and 25nm MLC NAND can be rated at 3,000 cycles, although their endrudance in real world may vary (but both should still last for at least 3,000 cycles). It's too early to conclude much based on our sample size of one. There's always the chance that our drive was defective or subject to a firmware bug. We'll be updating this section once we get a new drive in house for additional testing. They're only cheap now to get rid of them; once they're out of the channel people can't point to the old model discount for why the new one is too expensive.